Ohhhh I love the crabs at Mellben! Once again, it's another place that is too expensive for students like me and I am lucky because my parents love crabs! All I have to do is to remind them of how tasty Mellben's crabs are and I am already halfway there! Hehe. The crabs are big and to die for. When my family goes there, the sure orders are the Crab Bee Hoon Soup, Butter Crabs and the Man Tous (Fried buns). I am actually salivating just by writing this review! 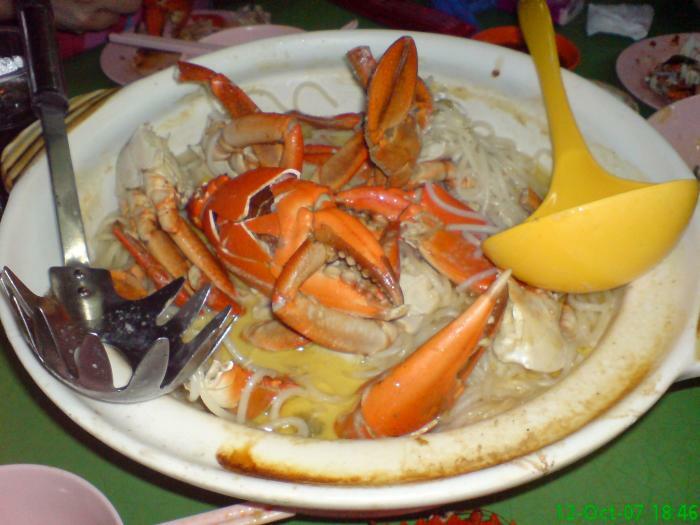 The Crab Bee Hoon is fantastic and pretty special but my favourite has to be the Butter Crabs! The sauce is so rich and creamy that I found myself licking off my fingers each time, making sure that nothing is left. Not very glam for a girl but it's that good! they've renovated the place since the last time i went, and the whole coffeeshop is converted into their restaurant. the boardwalk is quite nice, and the decor does scream of its specialty - crabs. a pity the standard of the food seems to have fallen. my frens shared my views too. it's still considered good compared to many other places though, so it's still worth a try if you've never been here before. we all preferred the chilli crab still, altho the butter crab is qt highly recommended. i think the chilli gravy is still more flavourful and needless to say, absolutely yummy as a dip for the fried man tous! do go early, maybe around 5pm, cos the queue starts lengthening from then on. Heard a lot about this place ( word of mouth recommendation ) and decided to check out last weekend. Being kiasu, we went there at 5pm and were at the car park cruising for a lot when we realized that there was already a short queue at the side of the coffee shop. When we started to queue, we saw that almost all tables were taken up. Some of the diners were staring at us with mouthful of bee hoon and every table has ordered at least one version of cooking the crabs. We waited about half hour before we were handed the menu and advised to order while waiting for a table. We chose the highly recommended claypot crab with bee hoon , butter crabs, tapioca leaves fried in sambal and chicken meat wrapped in otah. The butter crabs were first to be served and at one glance, we wondered whether we made the right choice instead of the usual black pepper or chillie crabs. 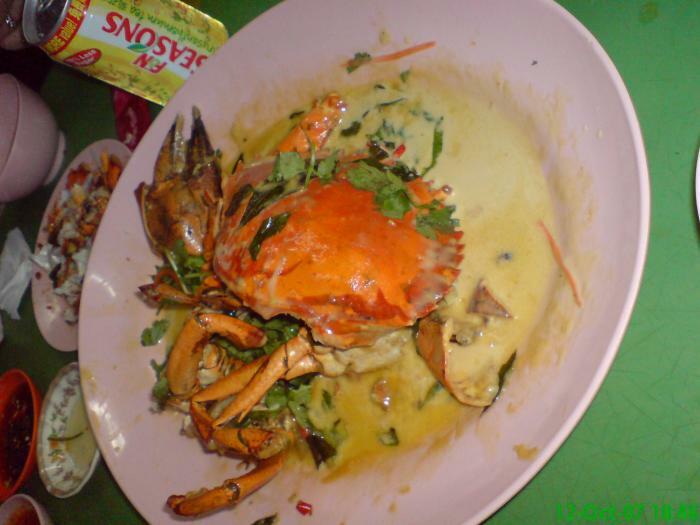 The crabs were covered with this yellowish cream and decorated with two small corianders. But dipping one small man tou ( deep fried bun ) into the sauce and hmm…the strong butter gravy fried with curry leaves was fantastically sinful but delicious. A class of its own.. 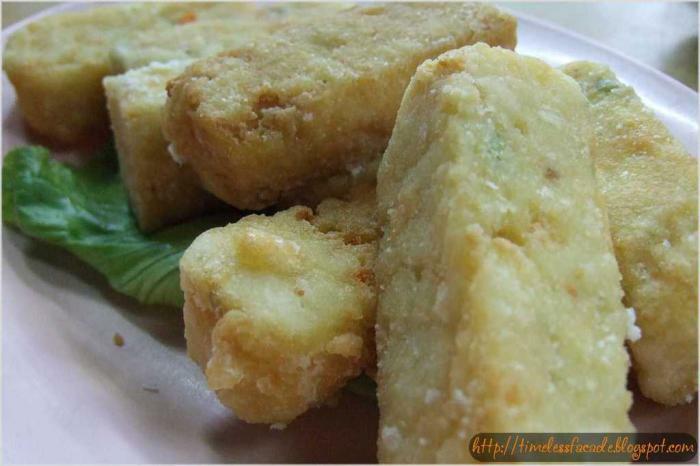 The fried tapioca leaves were superb spicy and goes well with the rice. 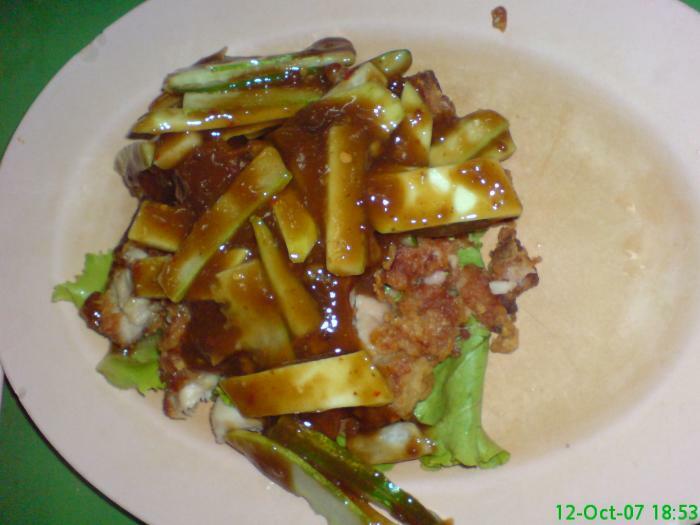 Next, fried chicken meat thinly sliced with otah stuffed in the middle. It was crispy and the combination blended well too. The main star attraction - claypot bee hoon was finally served. The buttery taste of the soup was unique and flooded with sweetness from the crabs. We totally enjoyed the crabs as they were meaty and surprisingly very fresh and juicy.